Coil cartomizers. Depending were you purchase these cartomizers will depend on how long they will last and how well they will perform. My clients here at Vintage Joye™ can not get enough of this new technology. It has 2 coils joining together to allow the ejuice to heat hotter producing much more vapor and better flavor from the ejuice. 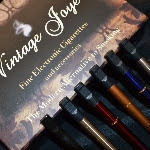 All of our kits are interchangeable, Vintage Joye™ only carries the best products out on the market that will perform as a true “Modern Alternative to Smoking”. If you have either our 510 or Ego model the new Dual Coil cartomizer will work with your kit. We have black to match your ecig or clear so you can see how much ejuice is in the cartomizer. If you are local here in Naples stop by our Retail Store on Goodlette just North of the Coastland Mall. You can try out the new cartomizers and see what everyone is talking about.